No more layers... unleash the magic. The Maybelline Lip Polish comes in a cute lip gloss tube with silver screw open lid. It is travel friendly. The applicator looks pretty and easy to use, it helps to spread the lip polish evenly on the lips. The shade looks more like brown in the package and in the swatch it looks like mauve pink though on the lips it looks totally different. There is no smell in this lip polish and the texture is so creamy with glossy effect. Well this product will be a boon for those who always use lipstick with lip gloss as they don't have to use two products if they have this Maybelline lip polish and one can forget about applying lip balm as well. This being an great pink neutral shade it will be great for daily use. I loved the pigmentation it delivered on my lips as well and my pigmented lips completely transfers into lovely pink lips. One need to mix the shade before applying it on the lips. The applicator makes it easy to apply this lip polish on lips, covers every nook and corners of the lips and evenly spreads the lip polish all over the lips as well. I loved it really for it's pigmentation and creamy texture. The staying power of this lip polish is maximum 4 hours. If you consume any heavy meals then it will go off without any tint within 3 hours. If you over apply this lip polish it may bleed from your lips. 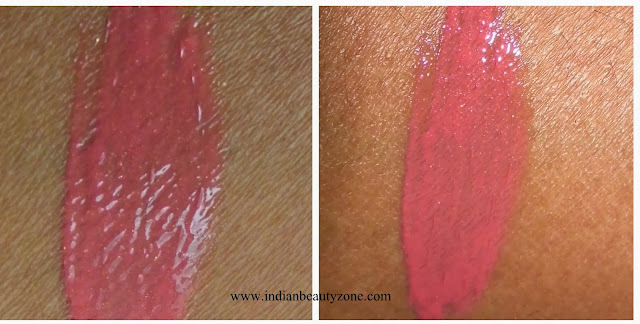 As it is a lovely pink I have tried it on my cheeks too and it gives a tint of pink glow for the cheeks as well. I loved the shade very much and it is my first pink neutral shade in the kitty. I am going to buy some bright shades from this range soon. This shade Glam 13 especially gives a natural glossy look for your lips even if you have pigmented lips. This shade has plumping effect on the lips and make it fuller. Had glossy and plumping effect on the lips. Covers the pigmented lips well. Can be a Substitute for both your lipstick and lip gloss. Can be used on cheeks to add glow. Those who wants long stay lipsticks may not like it. Maybelline Lip Polish Glam 13 is best pink neutral shade and has good pigmentation too. Maybelline lip polish collection has other awesome shades.